One of my favourite buildings in the East End is Wickhams Department Store, wrapped snugly around the former Spiegelhalters’ Jewellers in the Mile End Rd. But now the owners Resolution Property plan to demolish Spiegelhalters, erasing the extraordinary story it tells and sacrificing a unique architectural wonder for the sake of a glass atrium. Below I uncover the curious origin of this idiosyncratic landmark as a campaign to save Spiegelhalters gets underway with a Petition by David Collard demanding Tower Hamlets Council grant it locally-listed status. Observe how the gap-toothed smile of this building undermines the pompous ambition of its classical design. Without this gaping flaw, it would be just another example of debased classicism but, thanks to the hole in the middle, it transcends its own thwarted architectural ambitions to become a work of unintentional genius. Built in 1927, Wickhams Department Store in the Mile End Rd was meant to be the ”Harrods of East London.” The hubris of its developers was such that they simply assumed the small shopkeepers in this terrace would all fall into line and agree to move out, so the masterplan to build the new department store could proceed. But they met their match in the Spiegelhalters at 81 Mile End Rd, the shop you see sandwiched in the middle. The first Mr Spiegelhalter had set up his jewellery business in Whitechapel in 1828 when he emigrated from Germany, and his descendants moved to 81 Mile End Rd in 1880, where the business was run by three Spiegelhalter brother who had been born on the premises. These brothers refused all inducements to sell. I wish I could have been a fly on the wall of the office of those developers because there must have been words – before they came to the painful, compromised decision to go ahead and build around the Spiegelhalters. Maybe they comforted themselves with the belief that eventually the gap could be closed and their ambitions fully realised at some later date? 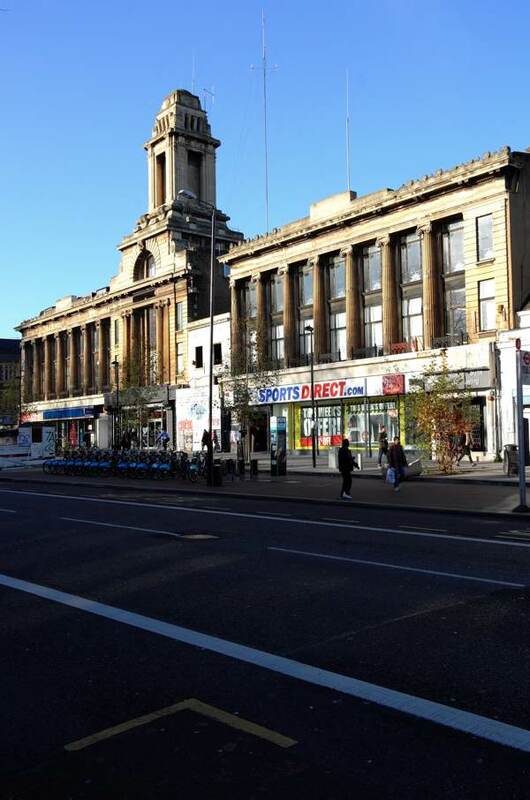 If so, it was a short-lived consolation because the position of the Spiegelhalters’ property was such that the central tower of Wickhams Department Store had to be contructed off-centre with seven window bays on the left and nine on the right, rather than nine on either side. 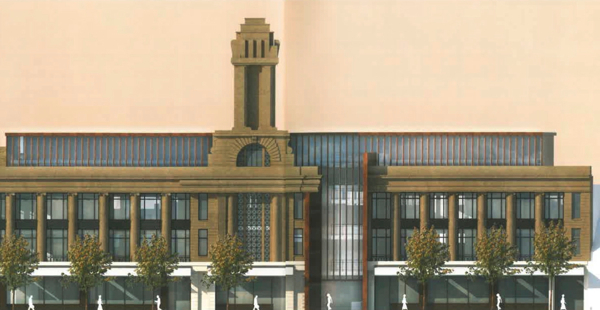 This must have been the final crushing humiliation for the developers – how the Spiegelhalter brothers must have laughed. 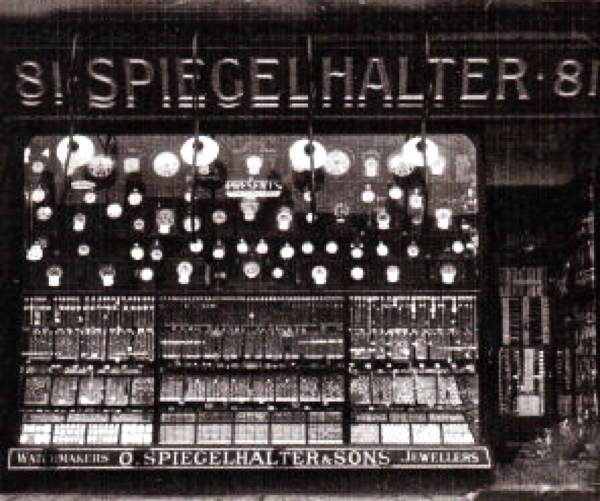 The presence of the word “halter” within the name Spiegelhalter cannot have escaped the notice of bystanders – “Spiegel-halter by name, halter by nature!” they surely observed. Those stubborn Spiegelhalters had the last laugh too, because the lopsided department store which opened in 1927, closed in the nineteen sixties, while the Spiegelhalters waited until 1988 to sell out, over a century after they opened. I think they made their point. 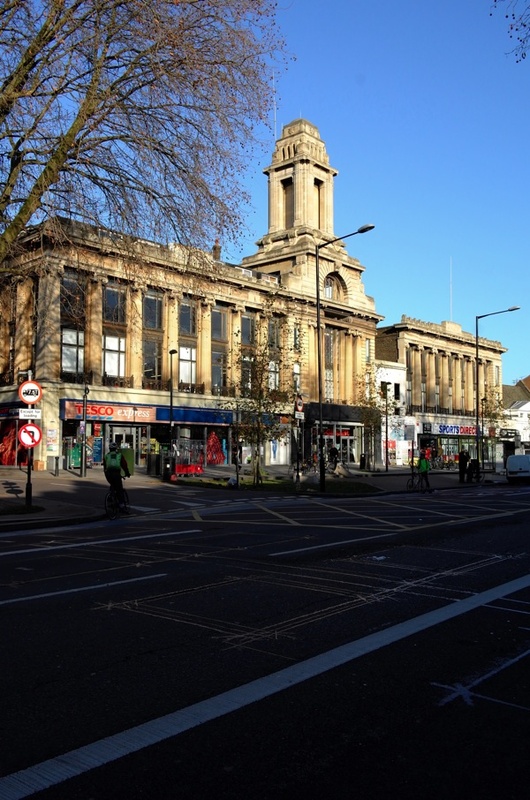 As part of a plan to redevelop this building in 2009, a planning application contained the following text,“the attractiveness and uniformity of 69-89 Mile End Rd is only marred by 81 Mile End Rd which is inferior in terms of appearance, detailing and architecture.” These people obviously have no sense of humour – proposing to demolish 81 and replace it with a glass atrium to provide access to the offices. Where are the Spiegelhalters when we need them? Five years ago, you could look through the metal shutter and see Spiegelhalter’s nineteenth century shopfront intact with its curved glass window and mosaic entrance floor spelling out “Spiegelhalters.” Since then, with disdainful arrogance, the owners of the building have destroyed this, leaving just the front wall of the building – ready to proceed with their glass atrium once they get permission. Yet at this moment, while the facade of Spiegelhalters still stands, the entire building and the story it tells is legible. So I ask you to show some of that Spiegelhalter pluck and sign the petition to save this remarkable edifice for future generations as an embodiment of the East End spirit. As self-evident testimony to the story of its own construction, the Wickhams building is simultaneously a towering monument to the relentless ambition that needs to be forever modernising, and also to the contrary stick-in-the-mud instinct that sees no point in any change. Willpower turned back on itself created this unique edifice. The paradoxical architecture of Wickhams Department Store inadvertently achieves what many architects dream of – because in its very form and structure, it expresses something profound about the contradictory nature of what it means to be human. Spiegelhalter literally means ‘mirror holder’, making its name maybe even more emblematic of the role it has played in stubbornly ‘halting’ the Wickham scheme while holding up a mirror to our contradictory human nature. I seem to remember that, most recently, the building was occupied by the Carmel food store, but that must have closed at least 10 years ago. So sad the building has already had its guts ripped out, more surreptitious destruction of heritage fabric by developers all too sure that they will ultimate prevail. All the more reason for signing the petition. We treasure Spiegalhalters shop because it has a story – one worthy of an old Ealing comedy where the little guys refused to sell out to the big bully company and so they had to build around them. It even has an after credits coda, where the little jewellers carries on long after the bigger building has gone bust. Passing it always makes me smile. It makes a lot of people smile and we don’t want to see it’s last vestige’s go. It is stories and associations that give an area a sense of place, of history, of humanity – which is something developers never seem to understand or desire. Their new development will be called Department W, a cold dehumanized riff on this once being Wickham’s Department store. It sounds like a warehouse for storing dead aliens. Long live the cause of Speigelhalter a long lived icon of east london.Keep up the good work. 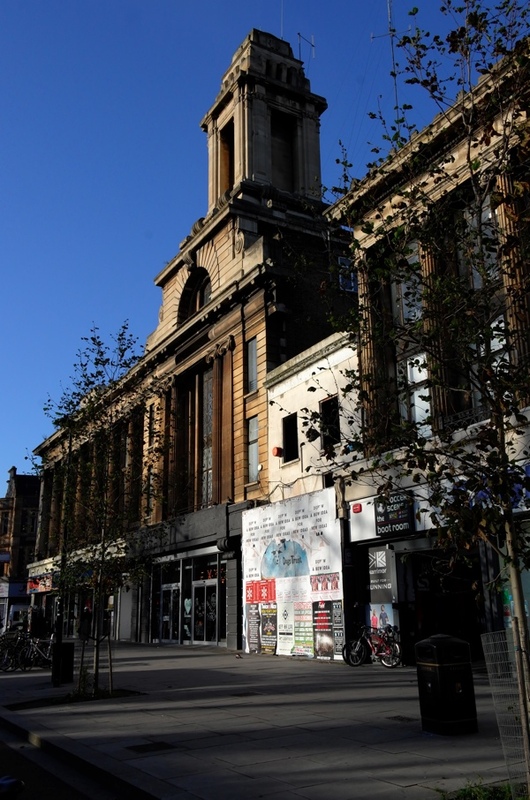 This absolutley must be saved, my mum is a Spiegelhalter and my granddad and his father owned Spiegelhalters in Kensal rise, we cannot lose this beautiful building in Mile End. It should live on just like our shop is in penzance cornwall. Ican remember this icon from my childhood visiting relatives in the East End from Southend on Sea in the 1950′s. it was always a source of joy osee the triumph of a ‘David & Goliath’style. 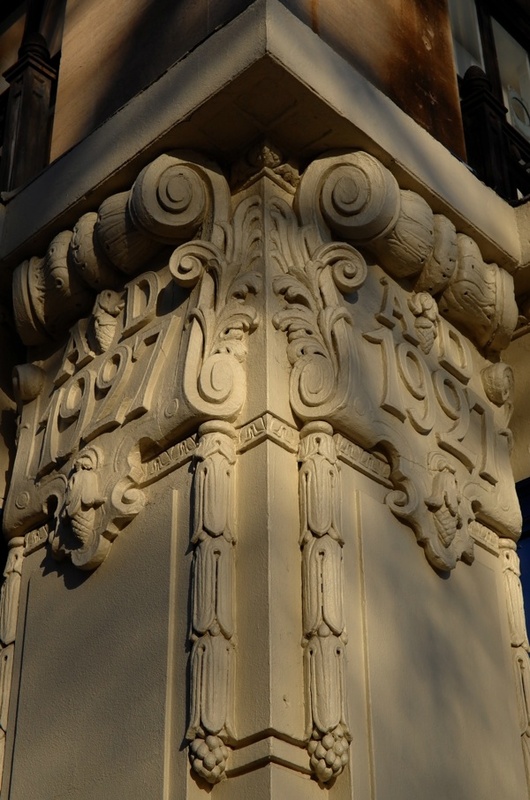 Even now it is a potent symbol of the triumph of the Spiegalhalter family. It should be preserved as a reminder that might is not always right. 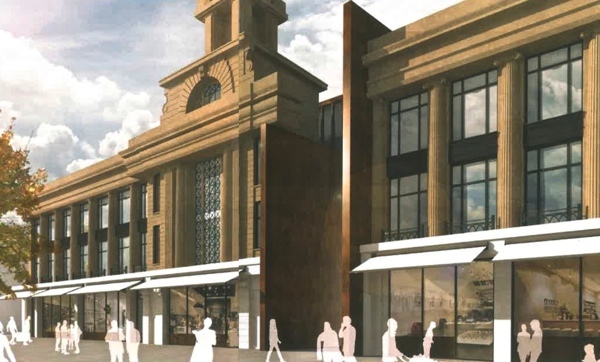 Please ensure it continues as a happy sign of that, to allow a successor to Wickhams to triumph would be a betrayal of a our heritage. In deed a plaque ought to be appended to the building celebrating the courage & foresight of the Spiegalhalters. What a wonderful tradition to be preserved! Generating as much support as we can down here in Cornwall. BJ Spiegelhalter and Son, jewellers in Penzance, distant cousins to the ones in Mile end and previously based in North West London, Kensal Rise. Would be a damn shame for the history of this building to be redeveloped. Don’t let it be demolished. In about 1949 my engagement ring was bought there, I still wear it all the time , a symbol of a very happy time and many years of happy marriage. Let it be a reminder of one family’s determination to keep history alive. I will be leading a walk on 5th March for my bowls club. I will tell them the story, such an interesting story, and hopefully more will sign the petition. I don’t want the building finishing the same way as Capt Cook’s house over the road. The story alone is worth preserving. I am distantly related to the Spiegelhalters – my grandfather was born a Spiegelhalter and then his family changed their name to Salter in 1919 to avoid problems after the first world war. I am proud to be decended from this ‘stubborn’ family! Let it stay – why not bring it back to it’s former glory or be creative with it and make it a unique place to visit. Too much of our heritage is being destroyed and although there appears to be little of the jeweller’s shop remaining, what does, should be a reminder of the spirit of the Spiegelhalters. I have a good friend, Eddie Spiegelhalter of Barnstaple and we were reminded of a similar situation when the owner of a small grocery shop in the High Street refused to move and a large store was built around it. We need people with the integrity to resist, whatever the cash inducement. Just because the Spiegelhalter building, and the Wickhams building surrounding it, appears to be unsightly doesn’t mean that it is less than a significant piece of history! It’s awful to hear that only the facade is remaining but I really hope that stays. Let this be an example of history and humanity. I think the Spiegelhalter building should be kept in place and made into a Cafe where gourmet coffee and tea could be served, and where conversation and individuality could flourish. This would seem to be in keeping with the historical events of the two buildings and the differing values. The goal would be not only to preserve the building, but to have a comtemporary use of the space well into the future, without loosing the old charm. I agree with Gloria, a coffee shop ot tea house would be fab. We need to keep our historic buildings not keep tearing them down! I live in Cirencester and was reminiscing with my next-door neighbour (born 1924!) 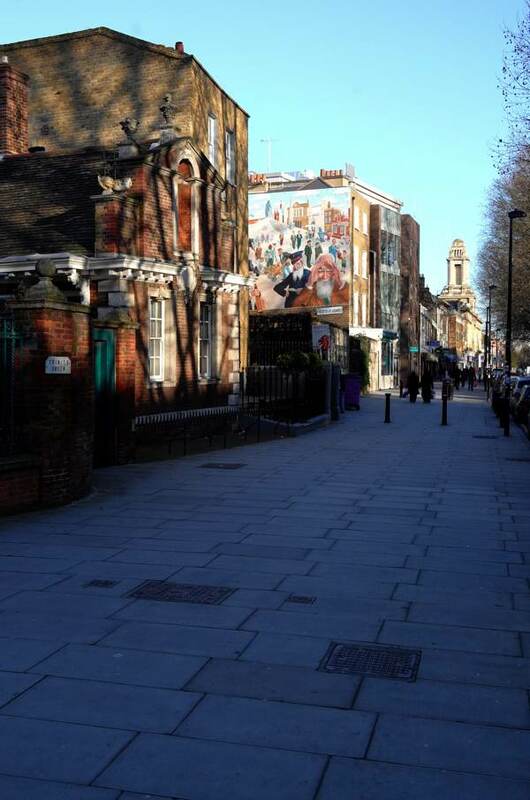 and we talked about Mr Spiegelhalter the jeweller and his little shop in Station Terrrace, Kensal Rise, our home town. Mr S. was a polite, very tall handsome man and had an equally fine son. When I was about 12 he sold my mother my first watch, but it was soon back for repair as it didn’t have Incabloc shock protection. When I was a boy I lived near Welling, Kent (now SE London) and a similar think happened there. A 1930′s built block of shops, I can’t remember, but it was about 6 shops, was gradually taken over by a car showroom They had all the ground floor knocked into one with folding glass fronted doors so they could put the cars out on the forecourt. That was except for a blemish on the last but one shop. It was a little furniture shop with its canvas cover sheltering its furniture on its own forecourt interrupting the desired monopoly of the second hand car shop owner. He held out for ages, but in the early 1960s the furniture shop owner either caved in or perhaps died. The car showroom had the whole block of shops in the end. What was the name of the road where this happened – Upper Wickham Lane! I only stumbled across Wickham’s/Spiegalhalters recently and was intregued by it. How can anybody not want this preserved for posterity? 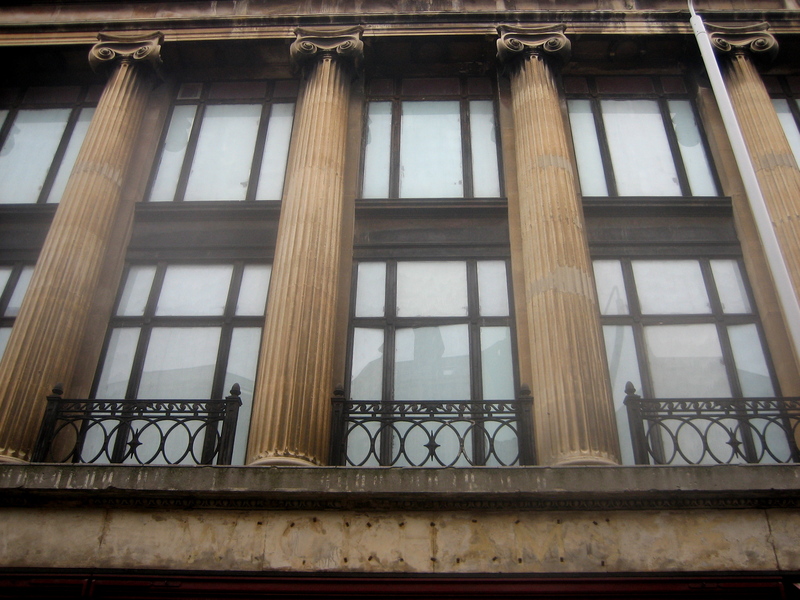 It is bad enough that the jewellers façade was destroyed after surviving for so long. I am sorry I am too late for the petition but I hope my interest now helps. My mother’s first job was a waitress at Wickhams, she was only 14 in approx 1929. They had to be very quick on their feet at that time & she told us that her sisters called her “quickhams from Wickhams” – she didn’t stay for long but ironically when she got engaged to my father in the 1930′s he bought the engagement ring from, you guessed it, Spiegelhalters – I inherited it & wear it often. Hope the petition was successful.